Japan Air Lines doesn't have the best web page, even for a Japanese entity. It's not as bad as trying to find a product on some random Rakuten page, but it can be difficult to navigate and prone to error. 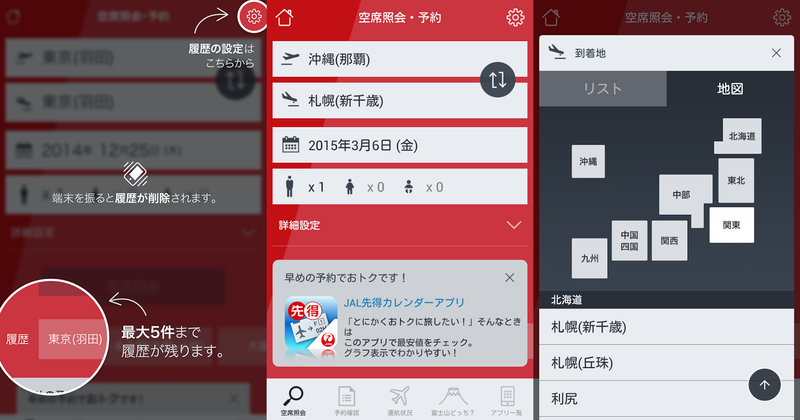 JAL's mobile apps had been similarly difficult to use, but their domestic flights app has been drastically redesigned. It's actually quite beautiful now (though still only in Japanese). 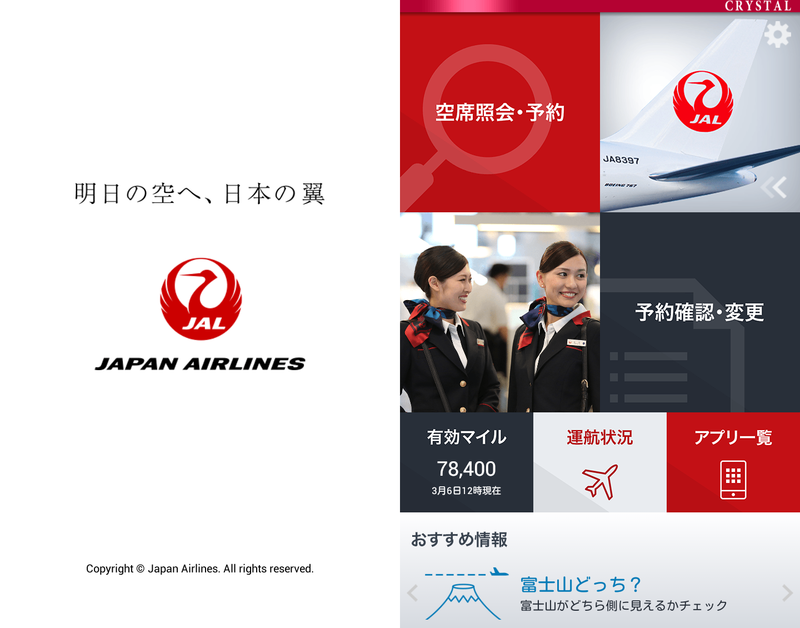 The JAL 国内線 app is the only one to be updated so far, and it is still just a front end to JAL's mobile website, but there are now dedicated buttons along the bottom of the screen that allow you to more easily navigate. There is also a small 'X' button in the lower right that will drop you back to the app's home screen from anywhere. Previously, it was easier to just kill the entire app and start over again. The one thing that totally makes this app worthwhile is the ability to switch arrival and destination airport with a single button, which was previously not possible from the initial search screen (and is still not possible on their PC home page). Another new feature is that all the regions are collapsable, meaning that you don't have to scroll through every airport in Japan to get to Okinawa. There is also a map for selecting region. The countdown timer is also nice. It displays the current status of the next upcoming flight on a home screen widget, as well as the remaining time until boarding closes (10 minutes prior to departure). Whether the flight has been delayed or is scheduled to depart on time is also displayed. The app also gives you periodic notifications beginning two hours from departure, and the boarding status is displayed on the widget. 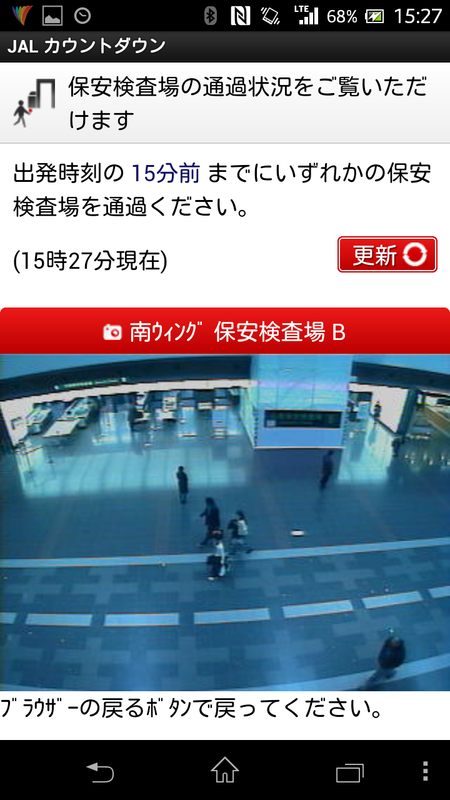 If you are using Haneda airport, you can pull up still photos of the current situation at the closest security check point to your gate. If you like using your phone for mobile payments and such, then you'll probably also like the touch and go app. This allows you to walk up to the security gate and tap in, just like entering a train station, with no need to check in. When doing this, you receive a receipt that resembles a boarding pass, but you still board the plane using your phone.